Video clip synopsis – Professor Richard Dawkins explains the significance of the finches collected during the Beagle 's visit to the Galapagos Islands, and how this iconic moment represents a failure rather than a triumph of Darwin’s scientific method. Broadband MP4 richarddawkins_bb.mp4 (11.8MB), suitable for iPods and computer downloads. Charles Darwin and the Galapagos Finches was recorded in 2009 for the television documentary series, Darwin’s Brave New World. A 3 × 1 hour drama-documentary series about how the Southern Hemisphere gave birth to the most controversial idea in science: evolution by means of natural selection. Interweaving dramatic reconstruction with documentary actuality and moving between the 19th century and the 21st, this series is the story of how Charles Darwin’s ‘dangerous idea’ developed during his epic voyage through South America, Australia, New Zealand and the Pacific Islands and how that idea forever transformed society and science. Darwin’s Brave New World is a Film Australia, Beckers Group, Ferns Productions co-production. Charles Darwin and the Galapagos Finches is on the website Charles Darwin – The Australian Connection produced in 2009 by Ryebuck Media in association with the Australian National Maritime Museum for Screen Australia Digital Learning. The website takes us on an adventure to explore the role Australia played in shaping Charles Darwin’s theories. The exhibition, television series and the website were produced to coincide with the 150th anniversary of the publication of Darwin’s ‘On the Origin of Species’. 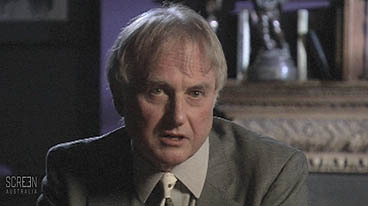 Professor Richard Dawkins is a British scientist and writer. At the age of 22 Charles Darwin seemed destined to become a clergyman when in 1831 he was given an opportunity to sail to South America on the small survey vessel HMS Beagle. The five year voyage exposed the young Darwin to the stunning nature of the world, triggering ideas that would come to explain the origin of life on earth and shake society to its core. The Beagle voyage proved the seminal event in Charles Darwin’s career, setting him on a path to become the most famous naturalist of the modern era. In 1836 Darwin briefly visited Australia, with stops at Sydney, Hobart and King George’s Sound. During the voyage the Beagle had visited the Galapagos Islands. Popular belief has this visit as a ‘Eureka!’ moment in the development of Darwin’s famous theory of evolution by means of natural selection. Describe the main features of the Galapagos Islands. What was the significance of the Galapagos Islands for the development of species of animals and birds? What did Darwin notice about the finches of the islands? What does this tell us about his scientific method? What mistake did Darwin make with recording the finches? Why was that a significant mistake? How was Darwin able to overcome that mistake? There is only one small mention of the finches in Darwin’s On The Origin of Species, but almost every biology textbook includes them as an example of adaptation by natural selection. Suggest reasons why this might have happened. Then carry out research online to see if you can test your answer. Research to find out how people reacted to Darwin’s ideas, and how they changed the way many people thought about the origins of the world.